Shop.CoolMaterial features unique, well-made goods targeted toward guys - handmade wallets, watches, every day carry gear, desk accessories, unique bottle openers, and much more. Shop.CoolMaterial takes pride in hand-selecting every item it carries. 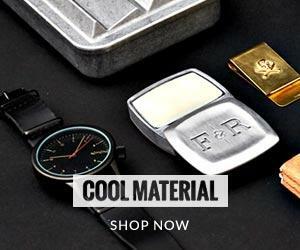 Join the Shop.CoolMaterial Affiliate Program Today! Why Join the Shop.CoolMaterial Program on Affiliate Window?